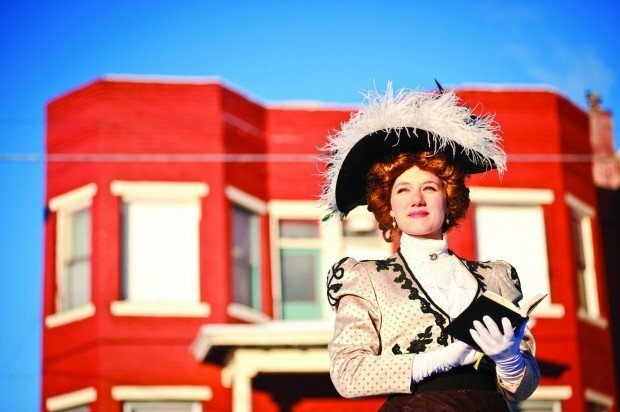 Haley Nelson, top photo, plays the controversial turn-of-the-century Butte writer Mary MacLane in “I, Mary MacLane,” which will be staged March 3-5 at the Silver Dollar Saloon. In this photo, taken recently, Nelson, in MacLane attire, is pictured outside the Excelsior Avenue home in which MacLane once lived. The silhouette of Cory Wendling, left, peers at performers Haley Nelson, left, and Joanne Nordhagen in a scene from Butte Burlesque, which will be performed after “I, Mary MacLane” March 3-5 at the Silver Dollar Saloon. Actor Cory Wendling has his arms full — with Haley Nelson, left, and Joanne Nordhagen — in this promotional photo for Butte Burlesque. The one-act play “I, Mary MacLane” and an evening of Butte Burlesque are planned Thursday through Saturday, March 3-5, at the Silver Dollar Saloon, 133 S. Main St., presented by the Big Sky Repertory Theatre. Show times are 7:30 p.m. Thursday, March 3; 8 p.m. Friday, March 4; and 2 p.m. and 8 p.m. Saturday, March 5. Seating is limited. Proceeds go to the Big Sky Repertory Theatre. Tickets are $15 each and are on sale at Books and Books, 782-9520. In the MacLane play, Haley Nelson plays Mary MacLane. Rob Cox plays the devil-god. Butte Burlesque features performers Cory Wendling, Haley Nelson, Melissa McGregor, JoAnne Nordhagen, Brian Mogren, Jason Driscoll, Shayla Cox, Andree O’Shea, Paula Canfield and Rob Cox, accompanied on piano by Joanne Lewis. Mary MacLane became famous for her diary-style book, “The Story of Mary MacLane” (1902), which addressed sexuality, writing, and an overall dissatisfaction with the role of women at the turn of the 20th century, among other topics. The production of “I, Mary MacLane” in Butte has been a long time coming. Author Joan Melcher, known for her book “Watering Holes: The Big Sky’s Best Bars,” first learned about MacLane while living in Butte in the early 1980s. MacLane’s writing of loneliness and alienation resonated with Melcher. The “delightfully refreshing” story stayed with Melcher, even after she moved to California. It was after sharing MacLane’s story with an actress friend in California that the idea for writing a play about the “Bohemian” MacLane was born. Although the work has been done as dramatic readings in California and Montana, thanks to Melcher and director Andree O’Shea, “I, Mary MacLane” will be fully staged for the first time in Butte. A reception for Melcher follows the Thursday night performance.